Wedding - a celebration that is not withoutspecial attributes. 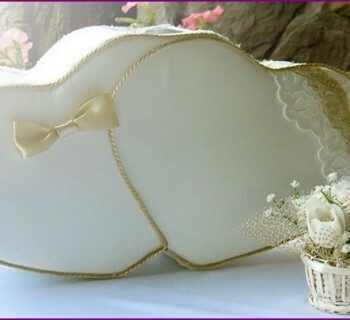 It includes invitation cards, candy boxes, boxes for money for a pillow rings and much more. An important detail festive event - it is glass, of which the couple drink champagne after the registration of marriage. The couple can show imagination by taking out wedding wine glasses with their hands, and detailed master classes with photos to help them in this. Decor glasses will not only save some money, but also make the original dishes of this family heirloom. 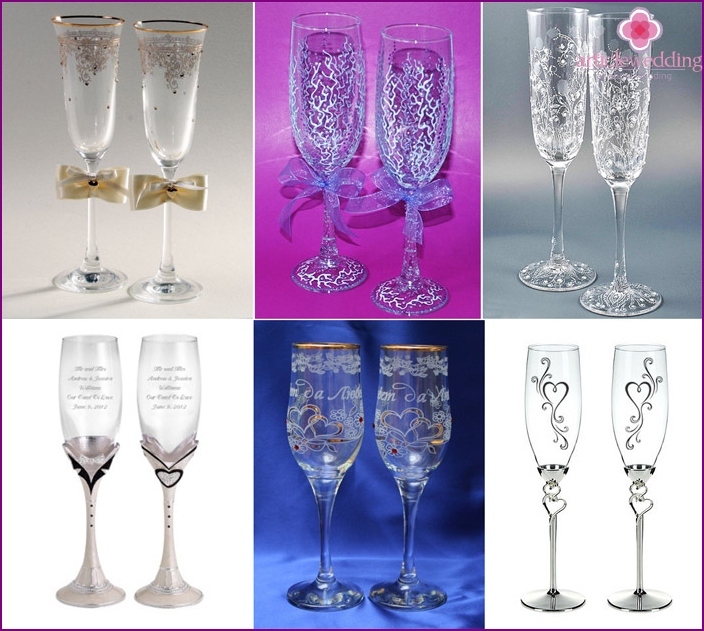 Usually, wedding champagne glasses decorated inaccordance with the style or theme of the celebration. 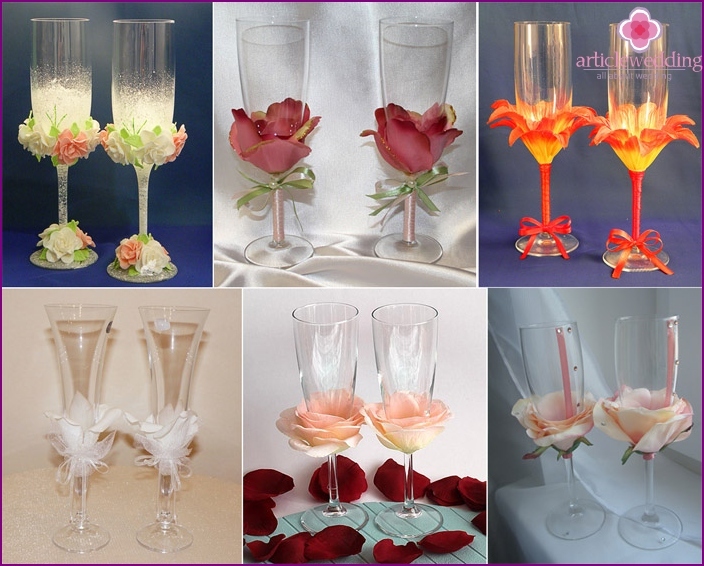 For a beautiful romantic wedding future spouses may engage in the manufacture of glasses, decorated with rose petals. This plant symbolizes the love between the bride and groom, and the hue of the selected flower will tell the true feelings of the newlyweds. Choosing a red rose, wedding culprits hint at the passionate nature of their relationship, white - purity, innocence marriage, pink petals talk about tenderness, respect, trust each other. 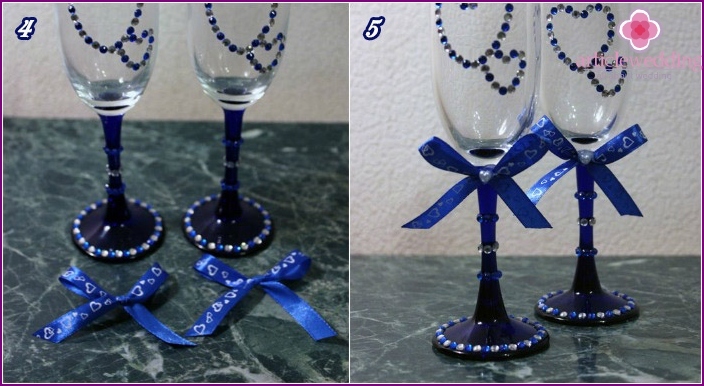 Glasses (better to decorate three or four, if the main wine glasses suddenly be broken). Two high-quality artificial right color roses (with neat petals). Clay (instant ceramic, silicone or superglue). Stained glass paint suitable shades (one - light, the other - a contrast). Carefully wipe the surface of the wedding productsalcohol or acetone solution - it will remove the grease from the glass, which makes it difficult to fix the elements of decor to Fougeres. Rinse under running water to remove any residual cleaning agent. Use a dry, soft cloth, rub the surface of the glass, so that could be heard creaking. Take artificial rose flower, petals fromcarefully disconnect the stem. Use the scissors to separate tiers, one after another, so as not to damage the surface of the plant. When all the petals will be disconnected, their scissors round the lower part of that there is no sloppy edges left. Begin to stick to the smallest petals wedding based products, creating a core rosettes. Wait a while until the dry adhesive. Take the larger petals, glue them a little lower than they were the previous portion of the artificial plants. Petals next tier should fully cover all resulting gaps. Continue to decorate wedding attribute toattaching each new layer larger pitch. When everything is ready, you get a beautiful foundation for the future of wedding products. Proceed with the second a glass in a similar manner, carefully attaching pitch. To make it clear who owns those beautifulbridal accessories, you need to make these products registered. You will need to paint the surface of the painting with the names of the newlyweds, and even, if desired, the wedding date. There is a little trick that will help to make a beautiful inscription, level: type your name in one of the Office programs liked font, and then print the text on paper or neatly write your own. Then lightly moisten petal water, placeinto wedding glasses. Names must be in the place where the inscription will be made paints. Make sure that the paper fits snugly against the wall and slid. Take a brush, paint it in mockney (do not takemuch so that she is not flowed). Gently circle the names. In order to make it clear where the wedding the groom attribute, and where the bride, make labels in different colors - red for the bride, for the groom silver. If color saturation is not enough, you need to apply a second coat. At the request can using acrylic paints to decorate the surface of an additional wedding items - swirls, hearts, stars, what your heart desires. 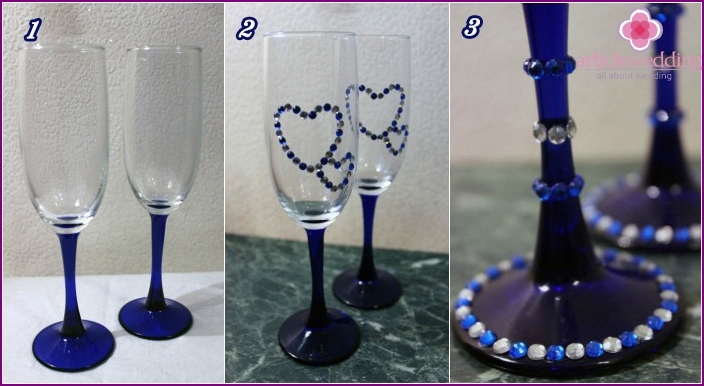 The final touch to the decoration of wedding wineglassespetals - pearl beads. Cut them in half, carefully apply glue, and then decorate them arbitrarily glass - will look great! Wine glasses with petals ready! 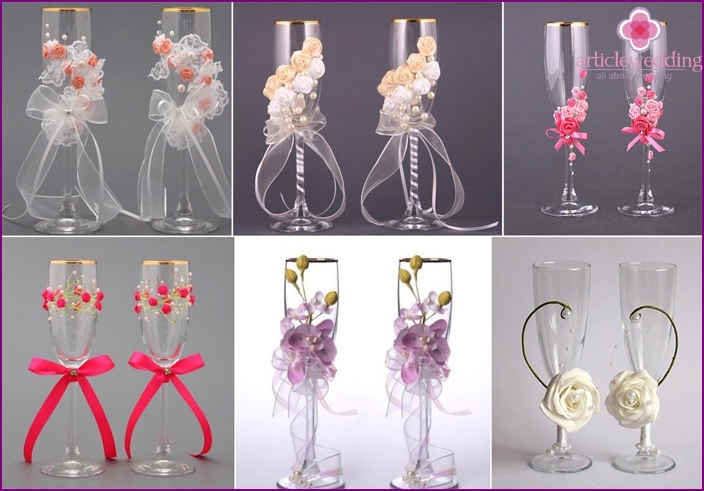 The options decorations wedding wineglasses petalsthe set - varies the color of plants, type of flower is used, the additional elements of the decor. Well look how concise glasses, decorated with petals and extremely elegant ribbon on the stem, and ceremonial attributes, richly decorated with sequins, beads, lace, stones or inscriptions. 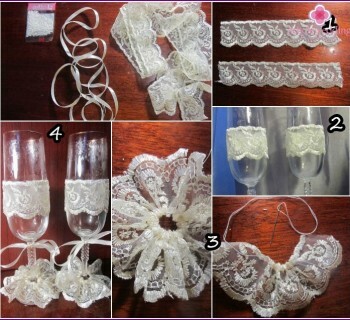 Wedding glasses decorated with ribbons, lookcute and gentle. This decorative element is able to give any festivity Fougeres - sometimes enough to tie the ribbon on top of the legs, to the usual dishes become a real wedding attribute. The following will be considered an option of self-design wedding attribute using polymer clay and fine satin ribbons. These glasses will be a wonderful decoration of the wedding celebration, their unique decor certainly pay attention to all those present. One stick of white polymer clay (color can be selected as desired). Thin satin ribbons of white and lavender shades. A pin with a head-ball. Wipe the surface with alcohol wedding productsdegreasing. Rinse with water, then dry, squeaky clean the glass of the future wedding with a soft cloth. Cut the sticks polymer clay slices of equal width. The resulting circles again cut into several equal parts - a future flowers. To make the base for the flower, take onecut a piece of polymer clay, roll it into a ball, then press to the surface of the paper. The required thickness of the foundations - about 1.5 mm, no less. If the clay is too fresh and strongly stick to hands, rub a little nail file pastel, then roll the details in the "flour" - they will not stick to your fingers or paper. Further down the line roll five balls (fivepetals), push them to the paper, then place it on the palm. To create a tab, take a pin with a round head, a circular motion, roll a piece of polymer clay from the center to the edges. The thickness of the finished part should be around 0.5 mm. To create the final form of petals for wedding wine glasses, slightly prischipnite from one side, making the corner. Carefully attach the petals to the base. Do it better with a toothpick, to avoid damaging the delicate flower. Take a few half parted buds. To do this, take three petals, gently blind by them together with a toothpick. To wedding wine glass was decorated with ornate, make small buds, like the flowers of lilac, which are just beginning to unfold. First make a ball, then roll it into a droplet. When ready, nail scissors, cut the top half drop, and then do the halves. All ready to put in a floral decorationoven baked for fifteen minutes at 110 degrees. Allow to cool in an open oven. Next, using superglue, attach the resulting product decoration for the wedding - it is important to make the right, a beautiful composition. Take a nail file, rub both pastel colors, mix. A brush rub the mixture into petals, and then draw the outline purple streaks. White contour draw patterns that appeal to you heart. Complete details of the resulting figures lilac. 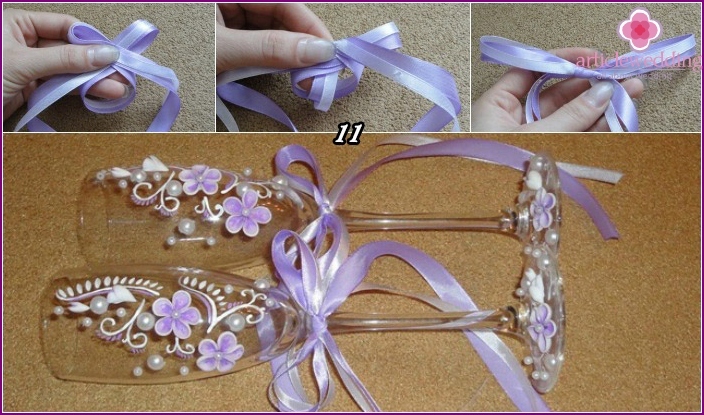 Stationery knife, cut the large beads, fix them to the surface of the wine glass wedding. Small decorations cut is not necessary - they adorn places that seem empty. Take two belts - white with purple. Fold their hinges, as shown in the first photo. Push one to another, gently tighten the knot to the ribbon is not twisted. Opal edge (as satin thread did not disperse and not istreplyutsya), and then paste the resulting bow to stem wedding attribute. Beautiful wine glass ready! 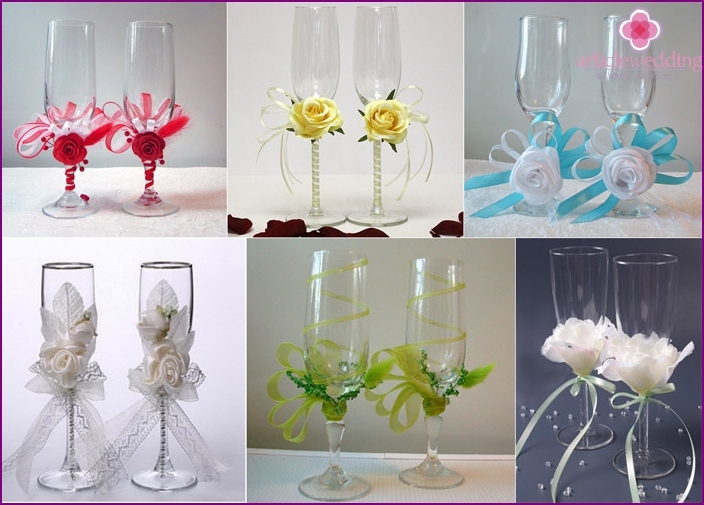 Looking through the various ideas of creatingWedding wine glasses with ribbons, the newlyweds will be easier to come up with and implement his own version. Feeds on a thin stalk champagne glass look elegant, highlight its elegance and decorations with ribbons and lace on the bowl look festive. They can be used satin, silk, tulle fabric of different width. If the heroes of the occasion - not fans of lacetapes, polymer clay or rose petals, wedding decoration beautiful version of the wine glass - this decoration with rhinestones. Shining stones will look chic, this design is perfect for formal wedding rich. Rhinestones can be inexpensive or Swarovski, but in any case they will help to create a truly original decoration wedding attribute. Rhinestones with adhesive base, which like the color. 50 cm satin ribbon, a suitable color. Wipe wedding products with alcohol, wellrinse them, then wipe with a dry cloth to complete purification. It must be remembered that after the wine glasses will have decorations, wash them is impossible - just gently wipe with a cloth napkin or rinse the inside. With regard to the design of the wedding attribute bowlit all depends on the imagination of the decorator - it can be initials or hearts, as shown in the photos. Garnish with some symbolic pattern wine glass on one side. To give Fougeres festive form glue rhinestones on the edge of the leg. Then decorate the leg itself - in three places as shown in the figure. Cut the tape into two equal parts, makeneat bows. To the ends looked carefully, they need to be trimmed - preferably diagonally. This type of pruning can cause that thread tape razlezutsya, so they definitely need to cauterize a little with the help of a match. Take the glue gun, apply a little glueon the tape, then carefully attach it to the bottom of the cup wedding products. Make sure that the adhesive has not been seen for a bow. The tape should be on the front side, which is paved with rhinestones pattern. 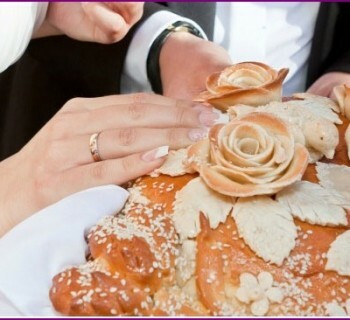 Cut the bead in half, attach one half to the center of the bow - this is the final touch of decoration wedding attribute. Beautiful wine glasses ready! A popular option decorations wedding wine glasssequins - the initials of heroes of the occasion, lined with beautiful sparkling stones. This design looks concise, but gives a really festive look this wedding attributes. 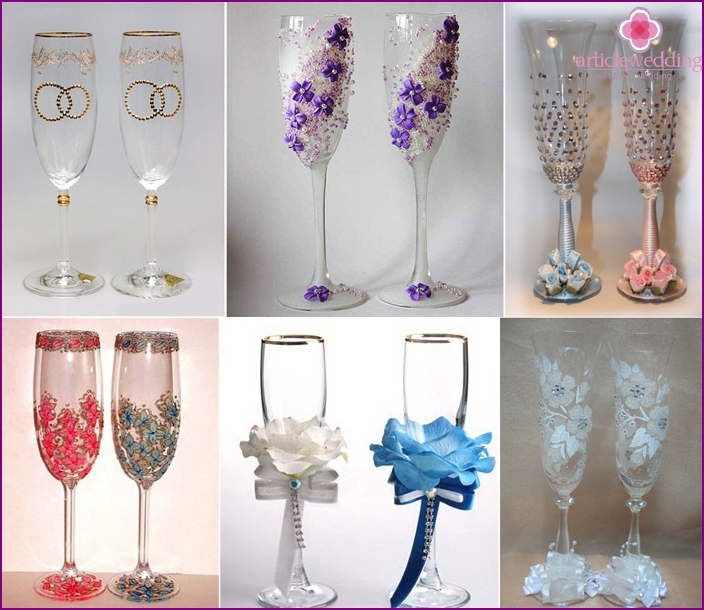 Wedding glasses look great, where crystals completely cover the glass leg - so the decor is not exactly go unnoticed. Another option might like newlyweds ornaments, implying an arbitrary arrangement of brilliant pebbles - it looks elegant and unusual. Choosing decorations for wedding wine glasses, futurespouses are usually guided by their personal preferences and theme of the upcoming event. If the heroes of the occasion organize a wedding in a certain style, the glasses should always reflect it. For example, in addition to the classic decor elements may use more interesting options - twigs, dry leaves, shells, chains, feathers. An unusual and can be painted wine glasses, which will emphasize the originality of a young couple. To create a beautiful decoration weddingattribute using rhinestones or beads, heroes of the occasion have to do the hard work - the imperfection of design wedding goblet small details will be immediately noticeable. The pattern created by these decorative elements can be minimalist or vice versa - a rich, pretentious, newlyweds must proceed from their own tastes. Lace - a gentle, airy material thatas if created for a wedding. If the culprit celebration married in a lace dress, champagne glasses decorated with this material, it will accentuate romantic, touching outfit. Fine fabrics can be decorated with glass stem, base or the middle of the cup - each option looks interesting in its own way. glasses of painting one of the most popular waysdecorate the wedding attribute, because the figures allow to realize any wish the newlyweds, to create incredible images. Based on their imagination, the future spouses can come up with a unique design: draw a graceful bird, frost or pretty butterflies. 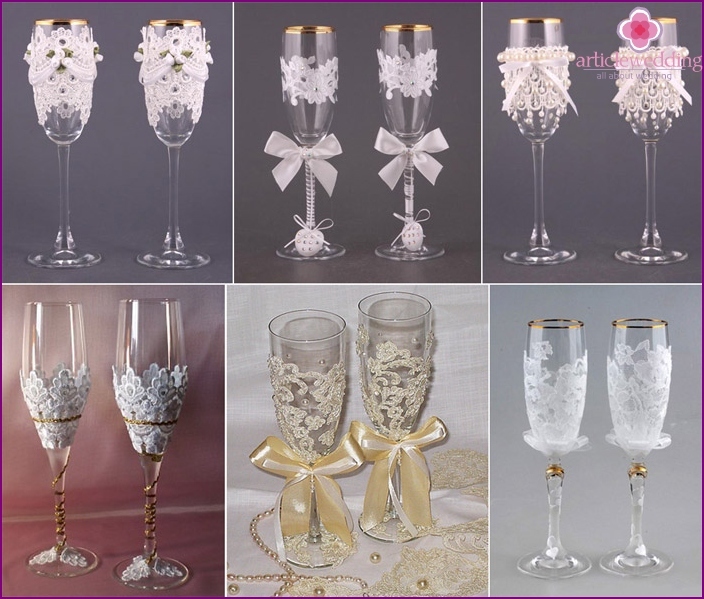 Wedding wineglass can only decorate the painting or additional decorations - ribbons, lace, rhinestones, beads, engraving.